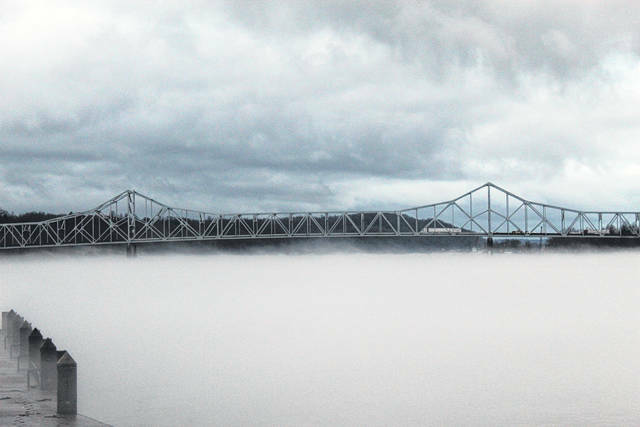 Fog settles in on Wednesday evening, obscuring the Ohio River from view. Pictured is the Silver Memorial Bridge as seen from Riverfront Park in Point Pleasant, W.Va.
OHIO VALLEY — The latest river crest predictions from the National Weather Service in Charleston, W.Va. are slightly lower than what was predicted on Tuesday, though a flood watch remains issued for the area. As of press time Wednesday, the NWS was no longer predicting flood stage at any stops along Ohio Valley Publishing’s readership area – from Belleville to R.C. Byrd Locks and Dam. At Belleville, the latest crest prediction is 33.1 on Sunday. Flood stage at Belleville is 35 feet. At the Racine Locks and Dam, the crest is now predicted at 37.8 on Sunday, below flood stage which is 41 feet. Though the NWS has no water gauge at Pomeroy, the river typically crests about three feet higher than Racine (depending on fluctuating weather), which puts the water at around 40-41 feet. Flood stage in Pomeroy is 46 feet and river crests at 42 feet put the water in the low spot in the parking lot near the boat ramp. In Point Pleasant, the crest is now predicted at 36.8 on Sunday, below flood stage which is 40 feet. At R.C. Byrd in Gallipolis Ferry and Eureka, the crest is now predicted at 42.6 on Sunday, also below flood stage which is 50 feet. The flood watch, issued by the NWS for Mason, Meigs and Gallia counties, is in effect until Thursday (today) afternoon. A flood watch means there is a potential for flooding based on current forecasts. Be prepared for potential closure of some roadways along creeks and streams. As previously reported, the combination of several rounds of moderate to heavy rain, and already saturated soils may cause flooding. Expect to see rises on creeks, small streams and eventually, rivers. Also, a flood warning was issued on Wednesday afternoon for northern Meigs County as well as north central Gallia County. That warning was set to expire at 7:15 p.m. on Wednesday. These river crest predictions, like the weather, are subject to change and Ohio Valley Publishing will continue to monitor any updates for our readers. Beth Sergent is editor of the Ohio Valley Publishing.